Will the real Richard McKeon please stand up? Depending on whom you ask, the professor was either a holy terror who frightened students half to death, or a brilliant mentor, helping them to see the history of thought in a new light. 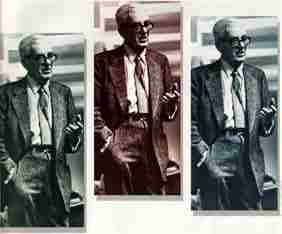 he taught at Chicago, philosopher Richard McKeon was legendary for inspiring cold sweat and raw fear. As English professor Norman Maclean, PhD'40, once quipped, students didn't say, "This quarter I'm taking McKeon," but instead, "This quarter McKeon is taking me." To some, he was simply an academic bully-a view immortalized in Robert Pirsig's 1974 autobiographical novel, Zen and the Art of Motorcycle Maintenance, in which the Chairman, a character reputedly based on McKeon, browbeats students "with a gleam in his eye" while graduating "only carbon copies of himself." But McKeon also inspired lifelong admiration, and from an impressive cast of alumni at that. Novelist Robert Coover, AM'65, "respectfully" dedicated his first novel, The Origin of the Brunists, to McKeon. Author and filmmaker Susan Sontag, AB'51, has called him "a teacher and a thinker of incomparable authority and importance." Philosophers Paul Goodman, PhD'54, and Richard Rorty, AB'49, AM'52, anthropologist Paul Rabinow, AB'65, AM'67, PhD'70, and literary theorist Wayne Booth, AM'47, PhD'50, are among the company of Chicago-educated scholars who have doffed their mortarboards to McKeon's lasting influence. It was largely these memories of former students-admiring or acrimonious-that McKeon left behind when he died in 1985. If he was an important philosopher, as his followers fervently insist, he never captured widespread attention with one blockbuster treatise. Instead, his published work is scattered among essays mostly found in obscure academic journals. Even those who tried to track them down often found these essays-usually densely written, with grasshopper leaps across vast terrains of intellectual history-too daunting to absorb. In many cases, McKeon packed into his essays the distilled essence of an entire course that he had once taught. And those classes were hardly walks in the park: McKeon's students, desperate to pick up subtle points they might have missed, commonly recorded his lectures and class discussions. With the kind of cult status associated more with jazz artists and rock bands, these bootleg recordings circulated among former students after McKeon's retirement in 1974. Acquiring several of these tapes in the late 1970s, David Owen, AM'66, AM'80, PhD'84, took the next logical step: If the best place to begin appreciating McKeon's genius was in the classroom, then why not make those taped classroom sessions available to the public in book form? His idea has finally come to fruition with the autumn 1994 release of On Knowing-The Natural Sciences by the University of Chicago Press. In Zen and the Art of Motorcycle Maintenance, a character based on McKeon upbraids students "with a gleam in his eye." Complete with lectures, discussions, exam questions, and McKeon's mind-bending blackboard diagrams, the book is the first in a three-volume series that presents each segment of a three-quarter sequence taught by McKeon in the 1950s and 1960s. These courses-continuing with the social sciences and concluding with the humanities-served as an introduction to the Committee on Analysis of Ideas and Methods, an interdisciplinary program that McKeon conceived and chaired. As such, the volumes provide a McKeon primer, making clearly visible the methodological structure hidden within his written work. Owen, who teaches educational philosophy at Iowa State University, originally contacted McKeon with his idea for the project in 1979. Owen offered the fact that he had taken and audited several McKeon classes as assurance that he could make a capable transcription of the often abysmally recorded tapes. For his part, McKeon agreed to check over the finished transcripts for errors, and the two signed a contract to get under way. With some finished lecture transcripts in hand, Owen returned to McKeon's office a few weeks later-only to find that the master's enthusiasm was gone. "I didn't realize-he didn't even mention it-that his son, Peter, had died of pancreatic cancer," says Owen, who then abandoned the project until a few years after McKeon's own death in 1985. At that point, he contacted Zahava McKeon, PhD'74, a retired academic and former student of McKeon's, who Owen knew was deeply involved in efforts to collect and republish her husband's work. She agreed to help Owen edit the transcripts and put him in touch with another former McKeon student, Douglas Mitchell, AB'65, a senior editor at the U of C Press. Mitchell took-or was taken by-a total of "18 or 19" McKeon courses as an undergraduate and doctoral student. His very first McKeon course was, coincidentally, the same course that Owen had transcribed for the first On Knowing volume. Mitchell says he registered for that class, called Ideas and Methods 211, in the autumn of 1963 as a kind of warm-up for the College's required introductory physical sciences course. He'd never heard of Richard McKeon. "It was given in Cobb 112, a corner room on the first floor," he recalls. "This extremely purposeful man strode into the room at a slightly forward angle and set up at the lectern. And it was, `Let's get down to work,' or `woik,' as he had a slight New Jersey accent. He was a Taurus in the zodiac signs, and it fit, because he had a very bull-like approach to getting things done." A willingness to plunge down the rabbit hole into McKeon's world became, David Owen believes, "a question of intellectual character. What he was doing was genuinely unique. As a student you had to start thinking in different ways than you were used to thinking. And that's a very difficult thing to do. You either become angry and go away, or you inquire further." Many walked, but for those who didn't, the class became a daunting test of cerebral stamina: a sort of boot camp for the mind. had no way of knowing it then, McKeon-in his introductory lecture to the class-"was laying out a whole constellation, a whole universe of philosophic assumptions that were extremely avant-garde at the time, having to do with how you organize knowledge. Now, looking back, I see that a lot of his philosophy was contained in germinal form in that first lecture." cessive week, which would be the basis of tension and uncertainty because last week's truth was no longer true, and eventually you wouldn't be quite sure why you were studying philosophy." Instead, "certain definite assumptions" will guide his approach. ("Most of them I will try to state today," he joked, "and then we'll forget about them.") One assumption is that "if you take any problem...and push it far enough, it becomes a philosophic problem." And any philosophic problem, when examined closely, reveals a set of assumptions that can be challenged by an alternative set of assumptions. "In terms of assumptions which you set up, 2 plus 2 equals 4, but what about circumstances-and there are many without fanciful elaboration-in which 2 plus 2 do not equal 4? How do they fit in, how do you deal with them, and, in general, how do you raise the question of fundamental differences?" These fundamental differences, McKeon goes on to suggest, are at the heart of intellectual inquiry: "Basic ideas are in an opposition which is constant, not dangerous; rather, they are productive of discussion, inquiry, and progress." "Notice, this is at opposite ends of the spectrum, and for 30 years the discussion went on," McKeon tells the class. Meanwhile, "each of the two camps was making contributions to quantum mechanics, yet each could take their position as a hypothesis for further work." The point: With every fundamental problem, be it scientific or humanistic, there are "alternative approaches which are in fruitful relation to each other." This applies to thinkers who were contemporaries-or centuries apart. To appreciate this dynamic, McKeon demanded his students learn more than what Plato or Aristotle had said on a given subject. Instead, says Owen, "he wanted them to understand how Plato would have handled Aristotle's position, and how Aristotle would have handled Plato's position." "Students would really learn for the first time how to read a text, how to read an argument," says Mitchell. "And that is the reason why, when you read these class discussions, many of the students appear lost or confused. What's wrong with their answers is they're not paying attention to the argument. They're just looking at isolated propositions or statements, rather than making connections." Reminded that his was among the voices of those struggling students, now published for posterity, Mitchell shudders. Although students' names were changed for the book, Owen, as the tapes' transcriber, knew which comments were the young Doug Mitchell's. "He offered to point them out to me," says Mitchell, whose response was, "Please don't. I don't want to know. It gives me the creeps." and offended, he did so, David Owen believes, rather unintentionally. "I suspect he may not have completely understood how far he was beyond everyone else. And so sometimes when students or people around him-faculty, other intellectuals-did not follow what he was doing, I think he got frustrated with it sometimes, as if they weren't trying....He may literally not have been aware how amazing his gifts were." Those gifts were first cultivated at Columbia, where McKeon took several advanced mathematics classes with the intention of becoming an engineer, but switched to philosophy, receiving both his bachelor's and master's degrees in 1920. In his doctoral studies at Columbia, McKeon's mentors were Frederick J. E. Woodbridge and former U of C professor John Dewey. From Woodbridge, McKeon would later write, he learned that "what philosophers meant might be comparable or even identical, despite differences in their modes of expression." Dewey, he writes, taught him how "to seek the significance of philosophic positions in the problems they were constructed to solve...."
In 1922, the budding philosopher left for Paris to study with some of Europe's greatest classical scholars-most notably, Étienne Gilson, who taught medieval philosophy at the Sorbonne. Three years later, he joined Columbia's faculty; over the next decade, he established medieval philosophy-long considered essentially theology at American universities-as a basic component of Columbia's philosophy curriculum. It was with this reputation as a medievalist that McKeon in 1935 was invited by Robert Maynard Hutchins to teach Greek and philosophy at Chicago. "I really had no reason to leave Columbia," McKeon later said. "I had acquired tenure. But at that time the University of Chicago was rethinking its basic curriculum, and I decided to take up Hutchins' invitation." Not long after McKeon's arrival on campus, President Hutchins made him dean of humanities-a position of power and prestige that, bestowed upon a newcomer, made many in the faculty suspicious or resentful. Regardless, during his 12-year tenure as dean, McKeon's input outweighed even Hutchins' "in reshaping the curriculum in the Division of the Humanities and, after 1942, in the College," writes U of C historian William McNeill, AB'38, AM'39, in his book Hutchins' University. His influence can be seen clearly in the adoption of three-year sequences in the humanities, social sciences, and natural sciences, and-long after this version of the College was dismantled, and McKeon's clout on campus had waned-in the Ideas and Methods program he chaired. In the polarizing battles surrounding the general-education movement at Chicago, McKeon was often stereotyped as a Great Books advocate, an Ancient (vs. the progressive Moderns), and a strict Aristotelian who analyzed texts based on the requirements laid down in the Poetics. "McKeon knew Aristotle-indeed, knew the entire Western canon-as well as anybody," says Owen. "But he was not a Great Bookser, saying the truth is everywhere the same and therefore education should be the same everywhere. This kind of stuff was absolutely not what he was about." Instead, McKeon believed there was an endless variety of approaches to knowledge: Although his classes focused on the Western tradition, his interests were global. Among his books is Edicts of A´soka(with N. A. Nikam, 1962), a translation of the writings of the ancient Indian emperor whose moral code endorsed nonviolence and acceptance of all faiths and beliefs. A´soka's code of tolerance was not far from McKeon's own. An early delegate to the United Nations Educational, Scientific, and Cultural Organization (UNESCO), McKeon helped formulate UNESCO's 1947 Declaration of Human Rights and was a founding member of its International Institute of Philosophy. Among its aims, McKeon said, would be to "examine certain fundamental terms, such as human rights, democracy, freedom, law, and equality" across a wide range of cultures and traditions. The fairest label to apply to McKeon, say his defenders, is that of "systematic pluralist": a thinker who allowed-indeed, demanded-a breadth of meanings, terms, and propositions so multifaceted that no one analysis or philosophic system was uniquely true. Zahava McKeon writes in her preface to Freedom and History, a 1990 collection of McKeon's essays: "He constructed a semantic schematism for analyzing systems of thoughts with great precision....This schematism made it possible to appreciate the philosophy of the past without taking sides." McKeon's disciples fought hard, sometimes futilely, to master the intricacies of McKeon's "semantic schematism." But what kept them coming back for more was the promise that this approach might clarify, codify, and unify conflicting thoughts and values, while respecting and preserving their essential differences. "Before I heard McKeon," says Owen, "the intellectual world didn't make much sense. It was just a bunch of people arguing with each other. McKeon was the first teacher who really tried to sort all that out." A lifelong appreciation of this approach began, for Doug Mitchell, back in a mid-quarter lecture on Galileo that McKeon taught for Ideas and Methods 211. "McKeon," he says, "asked his students to "look at the way Galileo puts an argument together to isolate three variables: time, distance, and velocity. And the intellectual act of conceiving of these things as finite variables and then putting them into proportions and figuring out how acceleration can be explained and understood in these terms-it just dazzled me." And then "a light went on," Mitchell says. "What Galileo had done for the sciences, McKeon was doing for the humanities: systematizing it, isolating a certain finite number of variables and methods for understanding all the discourses that have ever been conducted. Something like what Galileo did in the 17th century could be done in the 20th century for addressing the controversies and debates that stall inquiry these days." By collecting his work and transcribing his lectures, devotees like Mitchell hope that McKeon's voice will assume its rightful place in current debates over how knowledge is-or can be-organized, interpreted, and taught. That McKeon did not endorse a single answer to these questions may be not only relevant but consoling at a time when raging culture wars threaten to transform academe into an ivory Tower of Babel. "The progress of knowledge is, rather, that with the solution to any problem, a large number of unsuspected problems arise; and therefore, the more problems you answer, the more problems you have. This, I suggest, is not discouraging; rather, it would indicate that as thinkers, you have a future." The transcript notes that, at this point, McKeon and his students shared a good laugh. Go to feature, "Virtual TV," about a campus theater group that blends improv and situation comedy.